Last night I attended a fierce meatball competition at the Astoria World Manor called the Meatball Melee of the Boroughs organized by Dish du Jour magazine. In addition to the meatballs, the event was also part of the 8th annual Cuisine of Queens and Beyond showcase, where various neighborhood eateries got a chance to feature their best dishes (sort of like at the Taste of Queens). The following 10 finalists from four boroughs (the Bronx was missing) made it to the competition. Chef Psilakis was my favorite and it was exciting to listen to his commentary about meatballs, the best way to cook them and even some fun history facts behind them. He revealed why meatballs are typically round in shape - to ensure even cooking, browning and flavor. Frank Pellegrino was also vocal and offered his two cents about why Italian meatballs rule "they're not meatballs unless they have red sauce." 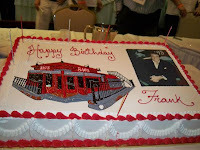 Also celebrating his birthday, Dish du Jour stopped the meatball judging to bring out an impressive, personalized birthday cake for Frank. The entire room sang Happy Birthday and it appeared that Frank was very touched. The competition was grueling and all 10 finalists exemplified their very best culinary techniques, bringing out wonderful flavor, presentation and variety. 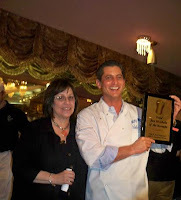 But in the end, one winner was announced and that was Bello Giardino of Manhattan with their "Nicky Meatballs"--named after Chef Nick Mormando (pictured above). The staff at Bello Giardino couldn't be happier and especially Chef Nick who stood proudly, accepting his award, smiling from cheek to cheek. The other competitors were great sports--they congratulated each other, joked around and resumed serving meatballs to the remaining hungry guests (I was one of them). Bar Stuzzichini - This was my ultimate favorite meatball because of its intense flavor and light aftertaste. I loved the slightly acidic red sauce, which was packed with fresh herbs and wonderfully pungent parmigiano cheese. The meat itself was tender but firm enough that it held its shape. The size of the meatball was pleasing, larger than a bite but not so big that you needed to take more than 3 forkfuls to finish it. Carmine's - A lot of people scoff at Carmine's because it's considered "touristy" and generic. But let me tell you, they make a mean meatball. It was the first one that I tasted last night and the incredible flavor did not escape me. I think that the meat was a blend of beef and pork and the inside was soft and juicy. Similarly to Bar Stuzzichini's, its shape held up well when punctured with a fork and I loved how perfectly round it was. I could envision myself eating a huge plate of it with spaghetti. Vesta - It's no secret that Vesta is one of my Astoria favorites and I adore their meatball. On the larger side, it definitely took a couple of big bites to finish but I loved--and savored--each one. What stood out to me was their sauce, nice and light with zesty fresh flavors of herbs, parmigiano cheese and toasted bread crumbs. I liked finishing each bite with a crunch of the breadcrumbs--it was a nice and unexpected surprise. Overall, the competition was friendly and fun with many smiles, laughs and good food all around. If you attended this event, feel free to pipe in with your thoughts and opinions. Btw, could u recommend any affordable restaurants in Astoria/LIC? Maybe some outside dining since the weather is so nice? Thanks. Veggie & seafood friendly is best. Thanks! I'd recommend Akti (Greek) , Vesta (Italian) , Mundo (Fusion, veggie friendly), Seva (Indian, really wallet friendly)and Sparrow (American). Have fun!